Virgin Atlantic published its annual financial results, confirming the successful delivery of its two year recovery plan and a return to profit. For the year ended 31st December 2014, the Group is reporting a profit before tax and exceptional items of £14.4m, representing an improvement of £65.4m on the previous year’s financial performance. The results confirm that Virgin Atlantic has delivered on the target it set in February 2013 to return to profit within two years. It is now looking to the future and positioning the business for future growth and sustained profitability whilst making significant investment in customer experience. For the third consecutive year, passenger satisfaction scores have increased, with an 11% improvement since 2012. The airline’s on time performance remains high with 85.5% of flights departing within 15 minutes of schedule. Virgin Atlantic remains focused on delivering the best possible experience and service to its customers enhanced by a £300m investment in this area by 2018. “We want to be the airline most loved by our customers by always putting them at the centre of everything we do. These profitable results mark the successful conclusion of our recovery period and have put firm foundations in place for the future. We are confident that we have the right fleet, network and partners in place to be more profitable than ever before by 2018. Strategic changes in the business along with operational and cost efficiencies have driven the improved financial performance this year. In October, the airline took delivery of the first of its state of the art, fuel-efficient Boeing 787-9s, with seven more to follow in 2015 as part of a fleet regeneration programme. 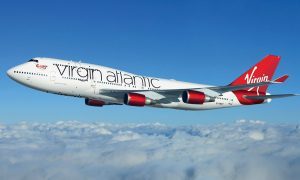 Virgin Atlantic and its customers gained significant benefit from its joint venture partnership with Delta Air Lines, launched in January 2014. Over 4.5million passengers flew on joint venture services in its first year of operation and the two airlines expect this number to continue to grow in 2015. The partnership’s total number of code share routes recently increased to 484 and its peak daily transatlantic services will rise to 39 from summer 2015. This includes ten daily departures between London and New York – the world’s busiest business travel market. 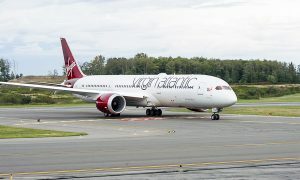 The increased transatlantic flying follows a network review undertaken by Virgin Atlantic in 2014 which led to its exit from several loss-making routes. The airline also took the decision to withdraw its domestic operation Little Red, with flights between Heathrow and Manchester ceasing later this month and Heathrow and Edinburgh and Aberdeen stopping in September 2015. New routes will be launched this summer between Manchester and Atlanta, London Heathrow and Detroit, and London Gatwick and Tobago, as well as a series of seasonal flights between Belfast and Orlando and Glasgow and Las Vegas. There will also be increased frequency in services between Heathrow and major US destinations including San Francisco, Los Angeles, Atlanta and New York. Virgin Holidays’ revenue and profit improvements were driven by a strong performance in its key North American market, where turnover grew by more than 10%, and disciplined cost control across the business. The company also enjoyed a four-point increase in its Net Promoter Score. During 2014, it implemented a new five-year plan to drive customer satisfaction, staff engagement and profitability to record levels by 2019.